Cut the rhubarb (unpeeled unless really thick and woody – shouldn’t be necessary with early-season produce) into 2” batons, halving the stems first if really chunky. Place in a shallow, rectangular baking dish and sprinkle with the brown sugar (to taste), orange rind and juice. Cook in a pre-heated oven at 160°C (Gas 4) until tender, but still whole, for about 30-40 minutes. Leave to cool, then add the amaretto liqueur if using. Make the base by crushing the amaretti biscuits in a food processor (or in a large plastic bag with a rolling pin), then mix in the melted butter until thoroughly blended. Tip into a 23cm round springform cake tin, greased and base-lined with a circle of baking parchment. Chill in the fridge while preparing the filling. Whip the mascarpone lightly in a large bowl with the caster sugar. Stir in the grated rind and juice of 1 orange. Whip the double cream separately until softly stiff, then fold into the mascarpone mix. Scrape the mascarpone/cream mixture onto the prepared base and chill the cheesecake in the fridge for at least 6 hours. 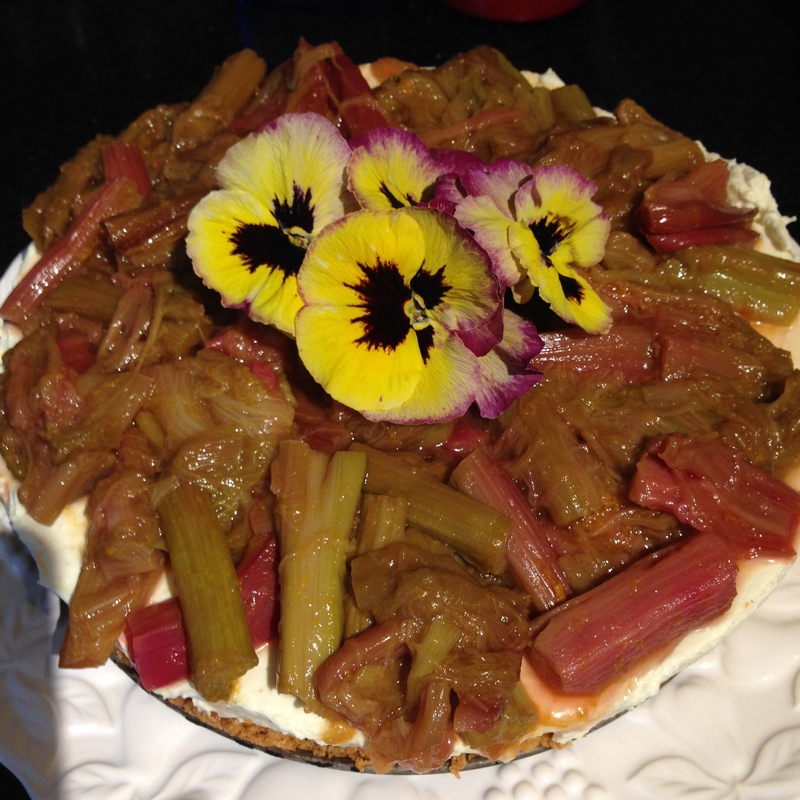 Just before serving, drain the rhubarb batons from the liquid (retain the liquid to serve separately in a jug) and arrange over the cheesecake, removed from the springform tin, as decoratively as you can. Put the double cream and milk into a small pan, the add the vanilla bean paste. Put the pan over a moderate heat and simmer for 5-6 minutes. The mixture will reduce a little during this time. Meanwhile, soak the gelatine leaves in a small bowl of cold water until soft. Remove the cream from the heat and stir in the sifted icing sugar. When dissolved, add the drained gelatine and the rosewater. Fold in the yoghurt. Pour the mixture through a sieve into a large jug, then pour into six lightly greased moulds placed on a tray – or use small espresso or tea cups if you can’t face turning them out afterwards! When cool, cover the whole tray with clingfilm and refrigerate until set – preferably overnight. To serve, turn out – you may need to quickly dip the mould in boiling water or run a hot knife around them! Or place the cups on a pretty dessert plate if you’re not upturning, of course. Serve with the rhubarb and orange compote. In season, I have also served this with a gooseberry and elderflower compote, cooked in the oven the same way as the rhubarb, but with a tablespoon of elderflower cordial rather than the amaretto. In this case, you could also add elderflower cordial to the panna cotta instead of rosewater. *Note: true amaretti biscuits (or home-made macaroons) shouldn’t contain any wheat flour, but some of the mainstream brands may. I’ve just checked on the Doria Amaretti I usually use and surprise, surprise they do contain wheat flour. Fortunately my guests weren’t coeliac, but PLEASE check if it’s an issue for you. 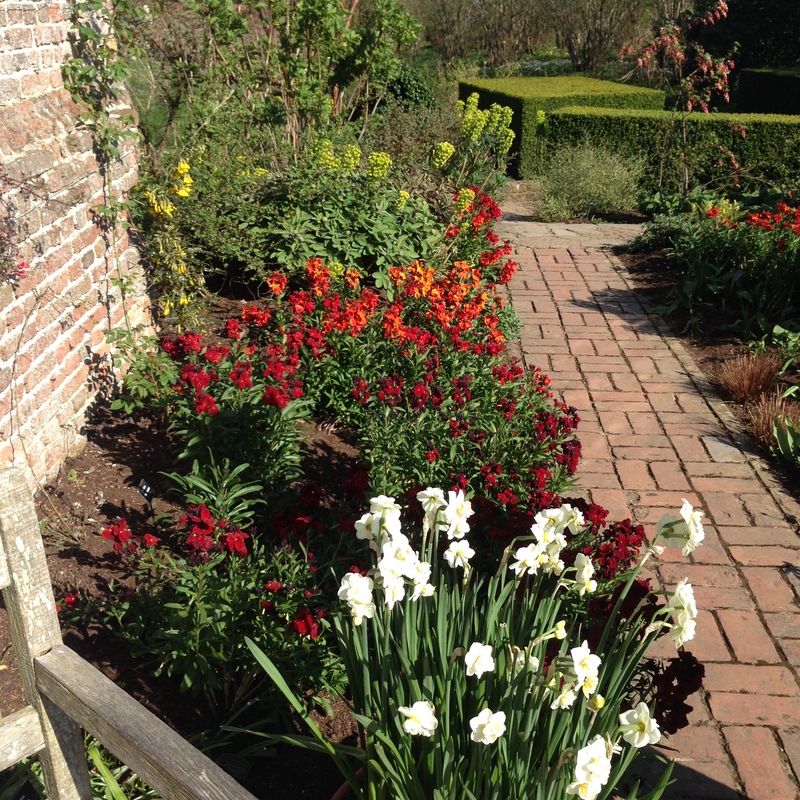 Wet weather on an Easter weekend – what a surprise! Still, at least my raised beds are being rebuilt down at the allotment today, so I can look forward to getting started with the new season’s planting very soon. 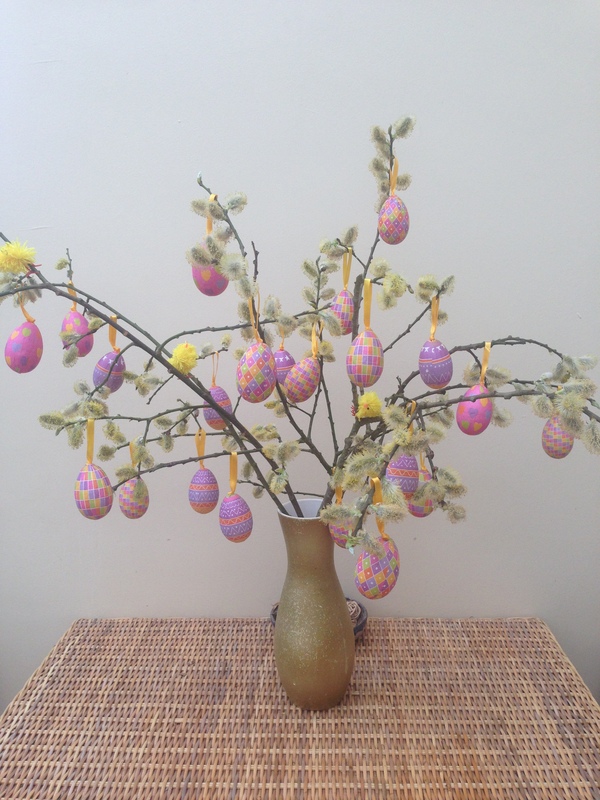 And it’s a perfect excuse to prepare some chocolatey treats for Easter and my weekend visitors whilst I’m stuck inside. 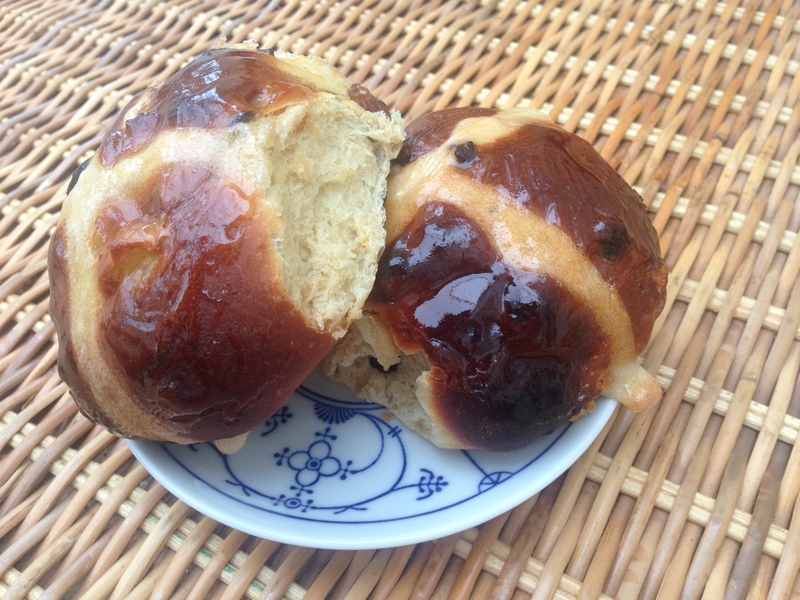 My very kind neighbour, even more baking-mad than me, if that’s possible, has just brought round some warm home-made hot-cross buns, which I’ll look forward to with my cup of tea later. 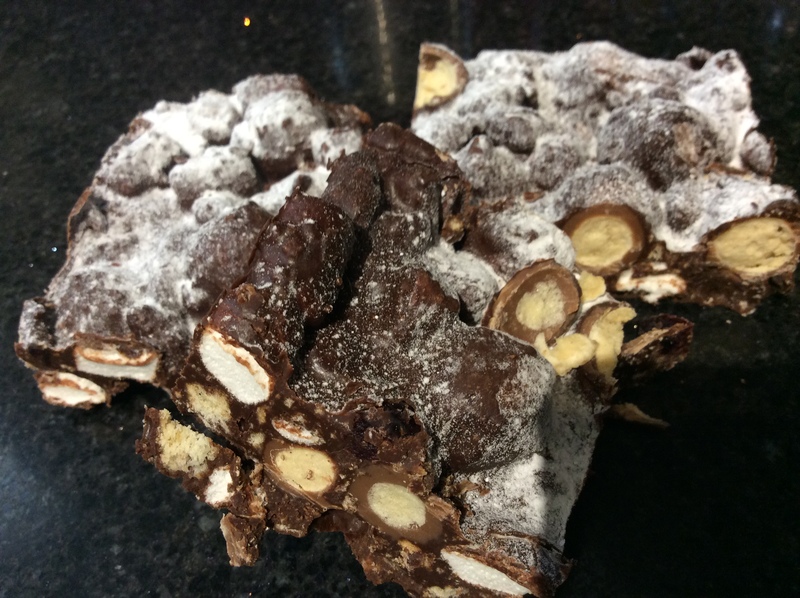 I was thinking more along the lines of Malteser Rocky Roads for my creation. I first tasted these at an open day at my son’s university (Bath) and felt compelled to hunt down the recipe online when I got home. If their aim was to sweet-talk prospective students into going to Bath, they certainly succeeded – they are scrumptious! I think the recipe I discovered (now a much-splattered cutting in my long-suffering recipe file!) was originally a Gordon Ramsay invention – but I’ve adapted it slightly as ever by adding some dried fruit and reducing the Malteser content – mainly because I couldn’t find bags with the precise Malteser content he specifies! If you want to give the fruit a miss and use all Maltesers, I can vouch for that too…. Line a rectangular 15 cm x 30 cm baking tin with foil and grease lightly. Melt the chocolate and butter in a large glass bowl over a pan of simmering water. Remove from heat and set aside for 10 minutes so it isn’t too hot when you add the Maltesers. Stir the crushed biscuits, marshmallows, dried fruit and Maltesers gently into the melted and cooled chocolate until well mixed. Transfer to the prepared tin and refrigerate until set.